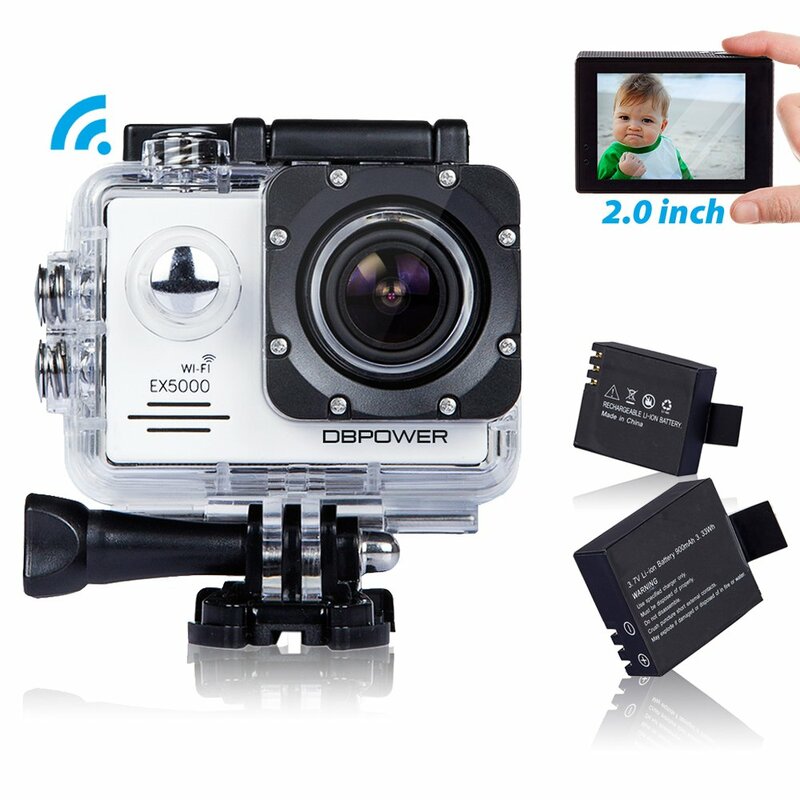 Home › Electronics › Dbpower Ex5000 2.0Inch Wifi 14Mp 1080P Fhd Waterproof Sports Action Camera Wi..
Dbpower Ex5000 2.0Inch Wifi 14Mp 1080P Fhd Waterproof Sports Action Camera Wi..
HIGHER QUALITY VIDEO CAPTURE: Your EX5000 Sports Action Camera contains a 14MP Panasonic CMOS Sensor with 170 wide angle lens that enables fast and accurate motion capture, offer a wider field of view and can take in more surroundings! MORE MEMORY STORAGE: Compatible with TF card up to 32GB: 8 hours of video in 720p or 5 hours of video in 1080p! Perfect for surfing, skiing, diving, biking, riding, driving, etc! Color: White Your DBPOWER EX5000 WIFI Action Camera is a more versatile and powerful device with an unparalleled overall performance compared to that of a GoPro, not to mention it only costs a third of the price! FEATURES/BENEFITS 2.0 inch LCD Display Screen: Allows to view real time pictures and videos you capture right away before connecting camera with Android or iOS devices. 14MP Panasonic CMOS Sensor + Ultra 170 Wide-Angle Lens: Allows to capture more captivating footage of yourself and your surroundings on every adventure! Resolution will be much clearer than the ordinary 12MP lens. Includes 2 Rechargeable Batteries: Extends your recording time from 88 minutes to 176 minutes. Never again fear that your battery will run out and the recording of your adventures will be cut short! Built-In WIFI: Simply download our App on your phone or tablet and connect with your EX5000 Action Camera using the built in WIFI. Then you can operate or review the images or videos via your Android or iOS device! Durable & Waterproof: The Water Resistant case provides water protection up to 30 meters depth, which specifically designed to withstand extreme environmental conditions such as: rain, dirt, heat, cold, dust and sand! WHAT YOU GET 1x DBPOWER EX5000 WIFI Action Camera 1x Waterproof Case 1x Waterproof Case Clip 1x Multi-Function Clip 1x Bicycle Mount 1x Camera Clip 1x Helmet Mount 3x Belts 1x Wiper 2x 3M Stickers 1x USB Cable 1x User Manual 2x Rechargeable Batteries CLICK THE YELLOW 'ADD TO CART' BUTTON ABOVE TO START CAPTURING YOUR ADVENTURES NOW!